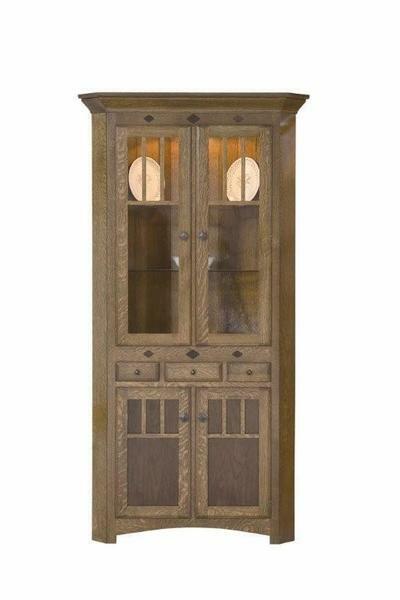 The Amish Royal Mission Corner Hutch is the ideal display for your fine china or collectibles. With three shelves protected by two carefully crafted glass displays, this hutch is a perfect compliment to any dining room or living room set furniture collection. The elegant Royal Mission Corner Hutch was designed for the corner, making use of great space while providing much needed storage and display. Beautifully crafted doors are at the base of this Royal Mission Hutch, and they open to reveal a storage shelf made of the wood you choose. Take a look at the Amish Royal Mission Chair and the Amish Royal Mission Trestle Table for a lovely matching set.Our Amish craftsmen use only the finest hardwoods. You can choose from 6 different hardwood species, and a wide array of high-end hardware. And because our Amish craftsmen handcraft to order, each piece of furniture is customizable down to the smallest details with a result that is truly one-of-a-kind. Feel free to contact us with any questions at 1-866-272-6773. Wall Width of Hutch: 26"
Wall Width at Top: 31"
The buffet arrived today. It is perfect. The craftsmanship is outstanding. Well worth the wait to allow real craftsman to build something special for us. It is so solid and well built. The delivery crew was great. It arrived without a scratch.